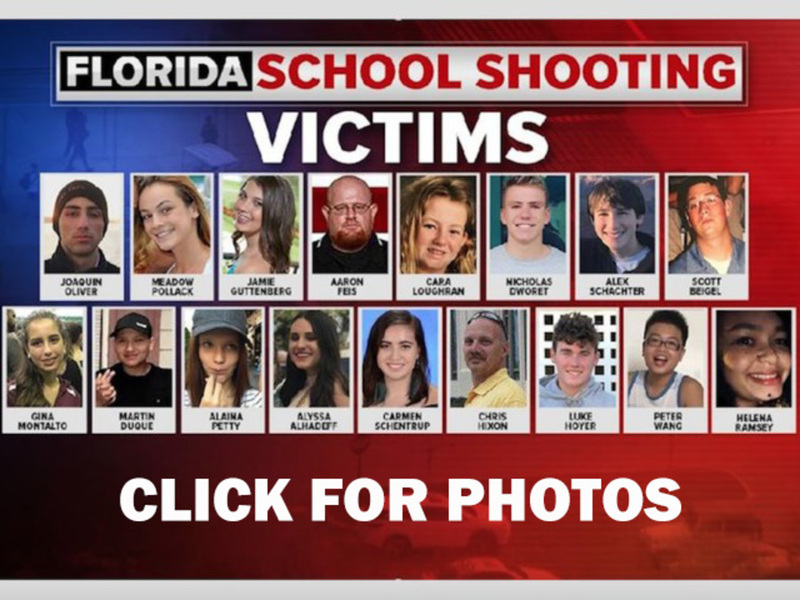 PARKLAND, Fla. (AP) — Students at a Florida high school where 17 of their classmates and staff members were killed returned Sunday to gather their belongings thrown down in panic during the school shooting nearly two weeks ago. Thousands of students joined their parents in walking past the three-story building at Marjory Stoneman Douglas High School where the Feb. 14 massacre took place. It is now cordoned off by a chain link fence that was covered with banners from other schools showing their support. "Just seeing the building was scary," freshman Francesca Lozano said as she exited the school with her mom. Still, she was happy to see her friends. "That made it a lot better." Sunday's angels were survivors of the 2016 Pulse nightclub shooting in Orlando where 49 people died, Decarlo said. The school reopens Wednesday and administrators said families would get phone calls about details later. Sunday was a day to ease into the return. "Two of my best friends aren't here anymore," said freshman Sammy Cooper, who picked up the book bag he had dropped as he saw the accused gunman, 19-year-old Nikolas Cruz, begin shooting. "But I'm definitely going to school Wednesday. I will handle it." Junior Sebastian Pena said the gathering was a chance to see friends and his teachers, and to "come together as a family." Earlier Sunday, Florida Gov. Rick Scott's office said he had asked Florida Department of Law Enforcement Commissioner Rick Swearingen to investigate the law enforcement response to the shooting. The agency confirmed it would start the investigation immediately. Broward County Sheriff Scott Israel has come under withering scrutiny after the r evelation last week that deputy Scot Peterson who was on the scene did not go in to confront Cruz during the attack . It is also facing backlash for apparently mishandling some of the 18 tipster calls related to the suspected shooter. The tips were among a series of what authorities now describe as the clearest missed warning signs that Cruz, who had a history of disturbing behavior, posed a serious threat. Israel defended his leadership Sunday and said investigators were looking into claims that three other deputies were on the scene but failed to enter the school when the chance to save lives still existed. To date, the investigation has pointed to only one deputy being on campus while the killer was present, he told CNN. Israel also labeled as "absolutely untrue" reports that the deputies waited outside even though children were inside the building needing urgent medical treatment. State Rep. Bill Hager, a Republican lawmaker from Boca Raton, has called on Scott to remove Israel from office because of the missed red flags. Israel vowed not to resign, saying Hager's letter "was full of misinformation" and "shameful, politically motivated." House Speaker Richard Corcoran stepped up the pressure Sunday, calling on Scott to suspend the sheriff. "In the years leading up to this unspeakable tragedy, Sheriff Israel, his deputies, and staff ignored repeated warning signs about the violent, erratic, threatening and antisocial behavior of Nikolas Jacob Cruz," Corcoran said in a letter signed by more than 70 lawmakers. Israel insisted that lapses were being investigated. He told CNN that a deputy who responded to a Nov. 30 call referring to Cruz as a "school shooter in the making" was being investigated by internal affairs for not filing a report and had been placed on restrictive duty. "There needed to be report. And that's what we are looking into— that a report needed to be completed, it needed to be forwarded to either Homeland Security or a violent crimes unit," Israel said. The FBI has acknowledged that it failed to investigate the tip about Cruz that the agency received on Jan. 5. The Associated Press obtained a transcript of the more than 13-minute phone call. During the call, the woman described a teenager prone to anger with the "mental capacity of a 12 to 14 year old" that deteriorated after his mother died last year. She pointed the FBI to several Instagram accounts where Cruz had posted photos of sliced-up animals and rifles and ammunition he apparently purchased with money from his mother's life insurance policy. "It's alarming to see these pictures and know what he is capable of doing and what could happen," the caller said. "He's thrown out of all these schools because he would pick up a chair and just throw it at somebody, a teacher or a student, because he didn't like the way they were talking to him." Associated Press writers Gary Fineout in Tallahassee, Florida, Adriana Gomez Licon in Miami and Jeffrey Collins in Columbia, South Carolina, contributed to this report.